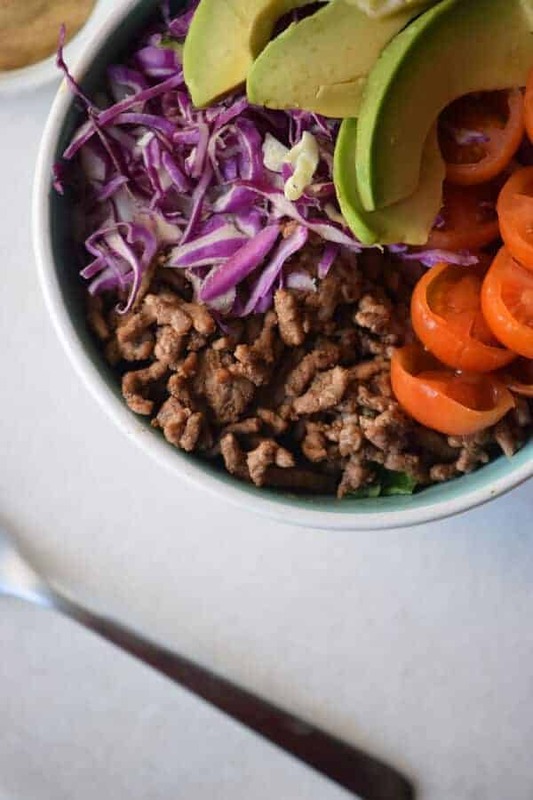 This Easy 20-Minute Healthy Keto Hamburger Bowl Recipe pulls together quickly for a simple weeknight meal. The flavoring is what makes the dish. 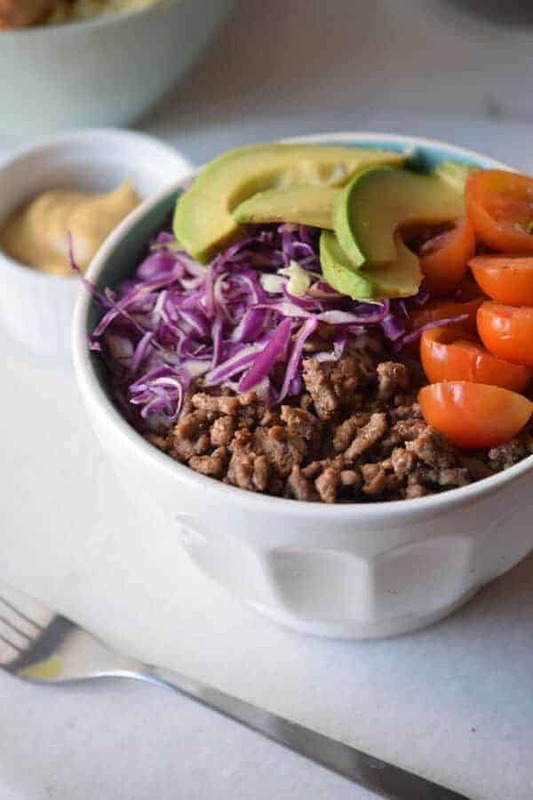 This season is crazy-busy for us around here, so at the end of the day I’m pretty much tired from running all the errands, so every time this season comes I make a commitment to cook only easy and fail-proof dinners, and this healthy keto hamburger bowl is one of my favorites. Actually, this is not only my favorite, it’s one of my family’s favorite as well! Why? Because it tastes way beyond delicious and it’s jam-packed with flavor. And can we please talk about the fact that this tastes like a real burger? Actually, if you ask me, I believe that it tastes even better. The secret is seasoning the meat to perfection. Your bowl is as good as the beef you are using, so use those spices, my friend! Every time I’m cooking the ground beef for this bowl I use paprika, garlic powder, onion powder, salt, and black pepper. I also try to pick grass-fed ground beef when possible and make sure that it has the lowest fat content I can find (I buy mine here). Actually, I like to make a triple batch of ground beef and then freeze it for later; it’s a life saver when life gets busy. 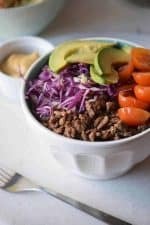 Plus it goes great, not only in this healthy Keto hamburger bowl, but also on top of a salad, served with some roasted veggies on the side, or over some quinoa, or even as part of a quick stir fry. 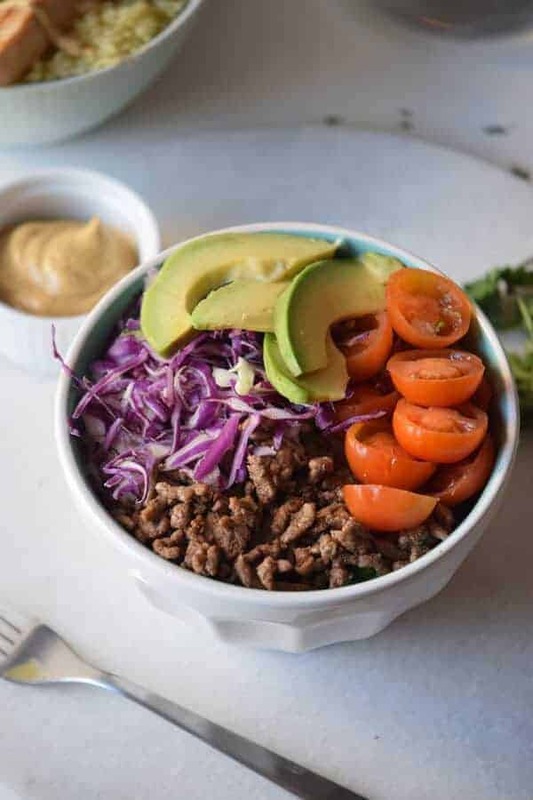 I also like to pack the bowl with other bits of deliciousness, like avocado, cherry tomatoes, and shredded cabbage. The avocado provides a lot of creaminess, so I don’t feel like you need to add any additional sauce or dressing. But, if you want to do a simple sauce, sometimes I add a clove of raw garlic and/or fresh cilantro to this Paleo homemade mayo. and use it like ranch dressing. I actually like it better than ranch dressing. This is also a good example of a meal that’s easy to adapt for the whole family. I often do things, like cook the ground beef with seasonings. Then I make myself something simple like this and put out the ingredients separately so each family member can make their own food, like some will add a tortilla or taco shell and cheese and have a more traditional Tex-Mex meal, some will each the ingredients plain on their plate and my husband will probably take the meat and make a quick Paleo stir fry with the ground beef and add a bunch of veggies. 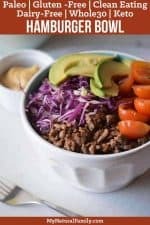 How do you like to eat your Keto hamburger bowl? Maybe you like to eat it more like a salad or you like salsa with it? I would love to know all your variations! how much is a serving? how many servings does this make? I count a serving as 1/4 a pound, so this makes 4 servings. This looks like something my kids would like because they don’t like their food mixed together.